I ended up with two damaged tires the other night. I put my spare on the front before realizing a rear tire was deflated and unfixable as well. 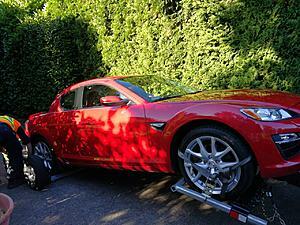 AAA sent out a flat bed, and the driver would not even attempt to put her on because of ride height. None of their other vendors would agree to come. Car is as from factory. Anyone had an issue towing an R3 (flat bed or otherwise?) I never anticipated any issues and assumed the tow companies have readily available options to deal with such circumstances. I have been paying a premium for a AAA Premier membership including MC and RV and was very disappointed in the outcome. This was late at night and tire shop was 2.7 miles away on smooth roads. After 2.5 hours of of interacting with AAA, I gave up with them and was able to get to my tire shop, slowly, with no damage to the wheels. While waiting I ordered four new tires from TireRack to be sent to my tire shop. Also, is their an alternative to AAA, for our cars, if the driver was correct in his assessment. I believe the Porsche Club may have a plan, and the BMW motorcycle club may have one as well. Sounds weird. A few planks of wood should get it on a flatbed. I had to get towed once, CAA (Canadian AAA) didn't bat an eye, just put some wood down and up she went. And back then the car was lowered a solid 2". AAA-subcontracted drivers had no issues towing my lowered S1. Of course, I told them not to worry about the front end plastics since they were held on with zip ties after I ruined them autocrossing. The flat bed did mash up the plastics a bit but they sprang back. I've also had a normal two-wheel truck tow mine with the rear wheels on a dolly. No issues there. If they can't get it on a flatbed for some reason, you can still tow it as long as the rear wheels aren't touching the ground(or you can damage the transmission). I got towed once and they just strapped the front end and put the rear wheels on dollies. No problems with that. Thanks everyone. I am going to call AAA and follow up. This really irked me after spending a very high annual fee for their premium service and having the peace of mind, that turns out was illusory. Keep in mind that AAA doesn't actually directly employ drivers. They just subcontract it out to various operators who slap their logo on their trucks. I've never had a problem. I had my FD RX-7 towed around to different places in So Cal (paint shop, engine shop etc) using AAA without problems and the clearance on that is about 3 inches. I've had my series 1 towed a few time without issues, and it has lowering springs installed. This is certainly something you should call and complain to AAA about. I also used AAA for all of my tows. Rx8 towing towing hooks, huge question?